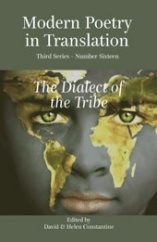 The current issue of Modern Poetry in Translation (Third Series, Number 16) is called ‘The Dialect of the Tribe’. A people’s self-identity springs in large measure from its language. For that reason when one people or nation annexes another, or wishes to homogenize itself, it will control or even seek to exterminate the languages within its frontiers by which difference and variety are signalled and asserted. Stop the language of a people, stop their voice. Without a voice, they are at your mercy. In this issue of MPT more than 30 ‘dialects’ or minority languages are represented or discussed, some widespread, some very local, all vitally interesting in their poetic speech. The world’s stock of languages, like its stock of species, is diminishing fast and the human race altogether is diminished by those losses. As so often in MPT, we demonstrate humanity’s abundance and in so doing show just how much there is to lose. In equal measure, this issue celebrates and alerts. The earth is vast and small, and in all its infinite variety there is much that for good and ill is the same and shared. A poem here in Yoruba bitterly laments what the oil industry has done to the Niger Delta; another in Nenets what it is doing to rivers and livelihoods in Western Siberia. But also here are poems of love, pity and solidarity from Gaelic, Filipino and Urdu. Love for native places is expressed in Romansh, Alsatian and Occitan. There are poems for children from Zapotec and Yiddish. Karen McCarthy Woolf gives us her grandfather’s Hoxton voice in droll and poignant poems of her own. Philip Gross compassionately picks up the broken bits of language that surface when the mind cannot hold. David Morley tells of his Romani childhood in Blackpool and inducts us into the very lively dialect of his tribe. MPT 3/16 has in addition essays on the translation of African-language poetry; on shifting between Danish, Polish and English; and on the important work of the Mercato Institute. And reviews of Indian poetry, the Turkish Avant-Garde, and much besides.